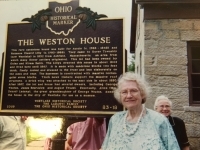 Doris Weston, one of the last surviving members of the influential Weston family of Dover/Westlake, is pictured at the 2005 dedication of an Ohio Historical Marker at the Lilly-Weston house. In the background is Alice Ladanyi, also a Weston descendant, who donated the historical home to the city in 2000. In part 3 and part 4 of this series, we introduced you to the oldest two sons of George and Rhoda Weston, Asa L. and Arthur E. Weston. In this article we will introduce you to their youngest son, Frank, who received the southern portion of their 100-acre farm on Columbia Road in the late 1800s. George, Rhoda and their sons had earlier occupied, and Frank was born in, the currently city owned Lilly-Weston house at 27946 Center Ridge Road, next to the Westlake Recreation Center. Based on a 1920s plat book it appears that Frank built a home, most likely at 2535 Columbia Road. While it no longer stands, in the 1930s it appears to have been split into two units, with the lower unit occupied by his grown son Wells Weston and his family in 1940, as per the U.S. Census that year. The same 1940 Census shows that the Weston name was still strong on Columbia Road with May E. Weston, her brother George I. Weston and his wife, Mida, and three adult children occupying 2283 Columbia (still standing), which was built by their father Asa L.; Burton Weston and his wife occupying 2363 Columbia (still standing), which was built by his father Arthur E.; Burton’s brother Charles M. Weston, his wife, Esther, and children (including Doris) occupying the house Charles built next door at 2391 Columbia (destroyed). It is no wonder that May, Charles and Doris loved and felt connected to Dover/Westlake – their neighbors and their family were one and the same! Frank and his wife, Ida, had two children, Ethel and Wells. Ethel married Robert Clifford and raised a family of six daughters and two sons, living across Columbia Road from her parents. They lived in a home constructed in 1923 at 2456 Columbia (still standing) on land originally subdivided by her uncle Arthur E. as part of a subdivision which created the eastern end of West Hedgewood Street. According to the 1940 census their children’s names were Beulah, Alice, Dorothy, Helen, Josephine, Francis, Robert and Myron. Their son Bob Clifford was a Westlake firefighter for much of his working life. Their daughter Dorothy Clifford Geis worked for many years in the Westlake Schools' cafeteria. Josephine purchased the family home in 1953 from her widower father. The other five Clifford children moved out of the community. It is one of those daughters, Alice Ladanyi, who we can thank for purchasing the Lilly-Weston house, the house her grandfather was born in, and donating it to the city. Frank and Ida’s son Wells, as noted above, lived on and worked the family farm for several years. He eventually moved to a larger farm in Lorain County with his wife and four children – Janet, Lois, Judy and Frank. As noted in "You’ve Come a Long Way Westlake…(and You’ve Got a Long Way To Go)" by Bill Robishaw, when it was published, the Weston name was disappearing from Westlake. Only two great-granddaughters of the original Dover Westons still lived on parts of their respective grandfathers' farms in 1993. Jeanne Weston Sleasman lived in her home at 2275 Columbia (still standing) until she died in 1999. Doris Weston and her widowed mother, Esther Weston, had the last mailbox bearing the name of Weston in Westlake, at 2391 Columbia (demolished), until Esther died in 1995 and Doris in 2006. It is no wonder that Alice Ladanyi insisted that the Weston family name be memorialized on a sign in front of the Lilly-Weston home at 27946 Center Ridge Road as part of the agreement when she and her husband donated the home to the city in 2000 for use as a museum. This was accomplished in 2005 with an Ohio Historical Marker. 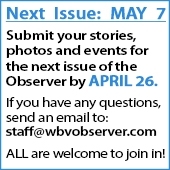 Now is the time to push forward with the renovation and transformation into a museum of early Dover/Westlake history.